This blog comes to you fresh from last week’s Global Data dairy summit in Amsterdam. So well within its sell-by date. Although I’ve worked with dairy industry clients for nearly a decade, this was the first time I have taken the opportunity to absorb a conference worth of issues, insights and innovation in this sector. So what’s happening down on the farm? The Dairy Industry is a strange beast: intimately connected to the very soil on which nearly all food production ultimately depends, but also a high-tech, massive scale, truly industrial machine, constantly looking for ways to add value to a commodity – milk. Most of us from dairy producing nations have grown up with the belief that dairy products are unquestionably good for us. But in recent years as our food has become ever more diverse, innovative, processed and cheap, the implicit goodness of staple commodities (including dairy) is being challenged as never before. Food technology and food science have driven most of the trends mentioned above, but after scandals such as ‘Horsegate’ and the obesity crisis evident all around us, trust in the food industry in general is at a low ebb. And as many of the speakers iterated throughout the conference, the problem seems to lie in misconceptions and disinformation that the dairy industry has failed to dispel. The required response from dairy co-operatives was well articulated by a triumvirate of Nordic heavyweights: Finland’s Valio, Norway’s Tine, and Denmark’s Arla. As Arla’s global Marketing Director Hanne Søndergaard put it: ‘Natural’ has been redefined. No longer simply about the absence of additives, the consumer now expects vastly more from a product that wants to claim this over-exploited (but highly valued) property: simple and fresh, transparent and real, sustainable and ethical, modern & relevant. High expectations indeed, especially when you consider that ‘modern & relevant’ is the door to an even bigger wish list, driven by the inflated expectations of consumers who are used to having it all. 1) Image is everything. In today’s social media driven world we all need to present ourselves in the right way. We carefully curate what we share in the knowledge that this reflects back on us, so making food and lifestyle concepts visually attractive really matters. Clean eating is a thing, but it’s no coincidence that the most salient brands in this (very white) space also ensure a cool instagram. 2) Seeing cool ideas from all over the world is now everyday social media fodder. Consumers are also looking in their own High Street for products to excite the senses: unique shapes, textures and colours, and food concepts from foreign cultures. With the entire world available online, anything from anywhere can be accessed in pursuit of novelty, pleasure and ultimately the kudos of having discovered it for your peer group. 3) We still love a great piece of storytelling in a classic TV commercial, but don’t expect that to get consumers to trust your brand. We trust online friends, bloggers and vloggers more. They are perceived as more ‘authentic’, even if the road from well-known online personality to brand ambassador can be a very short one. Turn up the dial and we enter the world of digital activism: calling out companies to highlight perceived failings in ethical standards or sustainability efforts. Dairy is a particular target for Vegans (a hugely popular idea amongst young digital natives, even if actual adoption is still small). 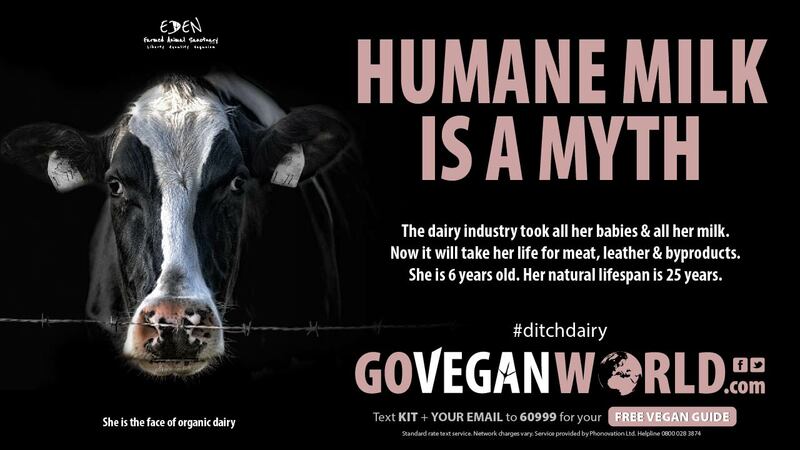 Claims against dairy typically describe a perfect storm of animal cruelty and dietary problems. So how can dairy fight back and tick those 8 boxes that define the ‘new natural’ proposed by Arla? Kevin Deegan, Consumer Insights Manager at Valio, had a very unexpected answer to that: don’t fight but instead learn from the lessons provided by dairy-free producers. Whilst to some extent they deliver on ‘modern and relevant’ by not being dairy, what they also do really well is to position their brands as both healthy and indulgent, with “optimistic and emotionally appealing” packaging designs. 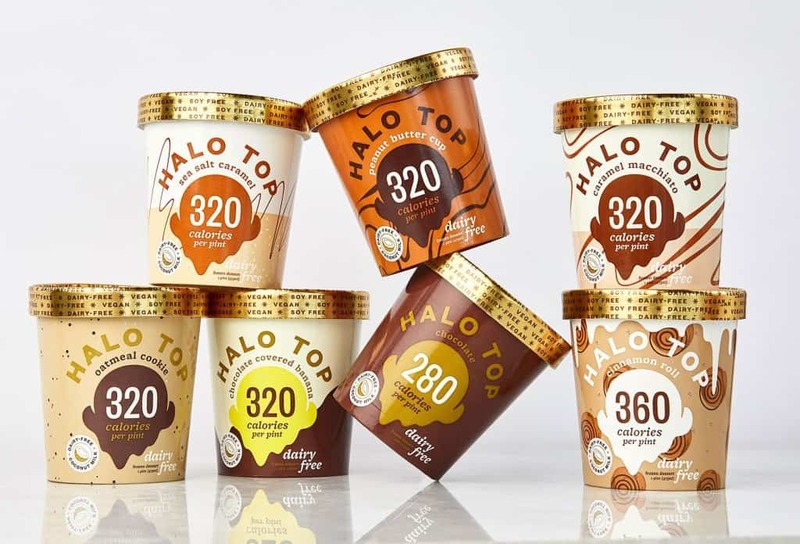 In the US Halo Top Ice Cream (with a full portfolio of both dairy and Vegan low calorie ice creams) presents both as super-indulgent. As a result, in just two years, the brand is bigger than both Haagen Dazs and Ben & Jerry’s. Yes, that’s what the man said! Frozen yoghurt take note, or have you finally given up? One of Valio’s R&D specialities is in developing products for lactose intolerant consumers (“the dairy alternative alternative”), and already most of their indulgent new products are launched under the EILA lactose-free sub-brand. 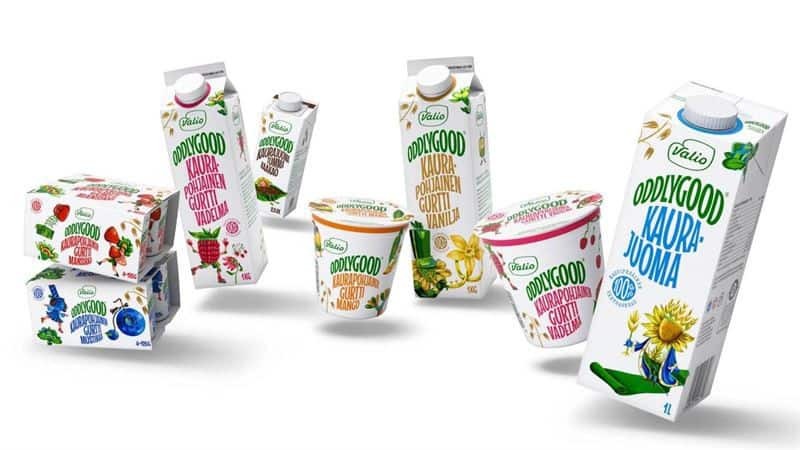 The company has gone much further, launching its own non-dairy, oat based brand: ‘Oddlygood’, available as both ‘Gurts’ (what you can call a non-dairy yoghurt) and Oat drinks. Danone doesn’t need to work out how to create a non-dairy brand as it’s already bought the Alpro brand through its acquisition of White Wave Foods. It’s also been watching the ‘local/sustainable/ethical’ trend for years, but recently the world’s 3rd largest dairy producer took the plunge and launched its own ‘small, local brand’ supplied by just 35 Organic farmers in Normandy, called ‘Les 2 Vaches’. That’s a tiny business for Danone, though if I’m being picky ‘Les 2000 vaches’ would be more transparent. From a branding perspective this couldn’t present itself more differently from the minimalist, hipster approach that characterises much organic dairy packaging: It’s crude, colourful and uses Danone’s cost-optimised super-industrial packaging forms. It’s also a close ‘admirer’ of Michel et Augustin, itself an innocent copy that has been hugely successful playing the small, personal, ingredient-conscious card in everyday food categories such as dairy, confectionery and bakery. As a welcome break from the challenges that ‘home’ dairy markets face, we heard from a country that simply can’t get enough new dairy products – China. Despite being new to liquid dairy and cheese (consumption is only 20% of European levels), China’s biggest dairy company Yili is already the 9th largest globally. As its European Open Innovation Manager Hittjo Homan explained, the company is already setting up production and innovation centres in Europe to meet future demand (at least 1/3 of which is expected to be imported). The Chinese milk scandal of 2008 (in which infant formula and some other food products were adulterated) dented consumer confidence in home-produced and especially budget segment milk products. As a result European imports and especially premium products are very much in demand. For example, Yili’s ‘Ambrosial’ ambient yoghurt drink has amassed sales of 2,5 billion Euro in just 2 years, and the company also boasts the No. 1 kids’ yoghurt and ice cream brands in China. Premium packaging and communication is used to give dairy products an aspirational image, but as well as ‘advanced packaging’, Yili is actively seeking innovation partners to help them adapt more products to Chinese tastes, to improve sustainability and to add new functional health benefits. The topic of how dairy can take a bigger share of the snacking category was discussed in a very popular round table discussion, hosted by Kerry Foods’ Director of Innovation, Deirdre Smyth. The traditional eating model based on meal times – breakfast, lunch and dinner – doesn’t work well for modern, urban, fragmented lifestyles. Snacking once had a poor reputation as something that should be limited to small bites that didn’t ‘spoil your appetite’, but since being re-branded as grazing, eating 5-6 small, nutritious mini-meals have been welcomed by many nutritionists as better for us. This means that snacking trends are really just food trends with portability. Convenience factors tend to limit snack formats to certain product types: Bars, Bites, Sticks, Mixes and Beverages, but what could dairy do better to increase its share of this growing market? An obvious challenge relates to ambient stability. A snack that needs to be ferried from one fridge at home to another at work limits its availability, relative to one that you can keep in your handbag or rucksack. On the other hand conferring ambient stability challenges perceptions of freshness and healthiness, two of dairy’s strongest claims. But sometimes we innovators overlook the obvious in favour of what our instincts tell us must be more valuable benefits. Kerry’s own research showed that the top consumer expectations of a snack are that it should taste good and doesn’t make a mess. Health is important, but its role is to give us the permission to indulge. Packaging’s role was viewed as crucial, with a to-do list that included being disruptive, wholesome and ergonomic. Looking across the table at Deirdre’s shopping haul from Albert Heijn, the impression was more one of shouty, colourful, overpacked and artificial. Looking forward to helping turn that situation around!